C-FLEA with some company aircraft at GREEN AIRWAYS dock, Red Lake, Ontario. C-FLEA of GREEN AIRWAYS, at Selkirk, Manitoba. C-FLEA on Howey Lake, Red Lake. • CF-LEA Eastern Provincial Airways Ltd (EPA), of Gander, NL. Regd 06-Nov-1958. • CF-LEA Re registered to Eastern Provincial Airways (1963) Ltd., on merger with Maritime Central Airways. Accident St. Anthony, NL, June 1964. Damaged when it struck a soft spot on the gravel runway while taking off. It nosed over on its back. There were no injuries to crew or passengers but the aircraft was out of commission while it was repaired. • CF-LEA Labrador Airways Ltd. Circa Feb-1973. Accident: Hopedale, NL. 19-Jul-1976. After take-off from the runway at Goose, the pilot of the Otter, which was on amphibious floats, did not retract the wheels, causing the Otter to nose over on landing in the water at Hopedale, coming to rest with the left wing in the water. The aircraft then capsized and sank. • CF-LEA Cargair Ltée., Lac Kaiagamac, St.Michel-des-Saints, QC. Regd 1978. Accident: Matagami Airport, Quebec 17th May 1979. The aircraft drifted off the runway during take-off in a strong, gusty, cross- wind. The pilot attempted to continue rather than abort and the left wheel-ski collapsed on striking a gravel hummock beside the runway. Repaired and returned to service. • C-FLEA Green Airways, Red Lake, ON. Regd 18 & 21-Jul-1980. Canx 16-May-2016. Power plant. Converted with the Polish PZL 1000hp engine. Summer 1996, at the Airtech facility at Peterborough, ON. Incident: Peisk Lake, ON. 14 April 1999 The ski equipped aircraft departed from Red Lake with the pilot and seven passengers on board, all fishermen, During the taxi to a suitable fishing area, one ski and gear leg broke through the ice. Minor damage to the gear and wing tip was reported, which was repaired. Total time: 24,716 hours since new. Aug 2013. Note: In storage at Selkirk, MB from Aug 2013. • C-FLEA Excellent Adventures Outposts & Air Service Ltd., Ear Falls, ON. Regd 16-May-2016. Canx 16-Aug-2018. Quoted as 20-May-2018. • C-FLEA Clarks’s Air Service, c/o Wayne & Karla Clark (2610721 Ontario Inc). Vermillion Bay, ON. Based Cedar Lake, ON. Regd 16-Aug-2018. Otter 286 was delivered to Eastern Provincial Airways Ltd (EPA) of Gander, Newfoundland on 6 November 1958 registered CF-LEA. It was hurriedly ordered by EPA to replace their existing Otter CF-GCV which had crashed on 14 October 1958. GCV had been engaged on a USAF contract, based at Frobisher Bay on Baffin Island, re-supplying a radar site on Resolution Island. Immediately after the loss of GCV, Eastern Provincial sent Beaver CF-GQU up to Frobisher Bay to continue with the Resolution Island re-supply, but an Otter was required and so LEA was ordered. Fortunately DHC were able to supply the replacement Otter very quickly. LEA was painted red overall with a white cheatline, a red tail with a white stripe, EPA’s standard Otter scheme of the period. As March Jones writes in his much-recommended book on EPA “The Little Airline that could”: “With the loss of Otter GCV on the Resolution Island contract in October, the decision was made to purchase a new Otter from de Havilland. This aircraft CF-LEA was ready for delivery on November 5th, at which time I test flew it in Toronto and accepted it on behalf of EPA. I departed Toronto on November 6 with Clayton Hodge as my crewman. We stopped at Montréal overnight and with an early start the following morning arrived Knob Lake with a refuelling stop at Sept Îles after seven hours of flying”. “The weather looked poor in the Frobisher and Hudson Straits the next morning. However it looked reasonable as far as Fort Chimo, Ungava Bay. Flying north that morning it was obvious that winter had set in as everything was sparkling white with snow. All the lakes were frozen solid but the rivers were still open. This was reassuring as our aircraft was equipped with wheel/skis, making every lake a potential landing area. After nearly 3 hours of flying we landed on the paved runway at Fort Chimo and parked near a Nordair Beaver. Clayton arranged for refuelling from Nordair at $2.60 a gallon, which was steep in those days. We were accommodated that night in the Nordair bunkhouse and treated very well”. “Weather reports north were favourable the next morning so after a hearty breakfast in the mess we were airborne and flying up the west shoreline of Ungava Bay over Cape Hopes Advance, then over the Hudson Strait which was open and looking very cold and inhospitable. The south coastline of Baffin Island was visible in the distance and it too looked bleak and formidable. After a one hour crossing we were over Baffin Island and in radio contact with the tower in Frobisher. After receiving landing clearance we touched down – four hours thirty minutes from Fort Chimo”. At that stage Otter LEA took over on the Resolution contract and Beaver GQU returned to Gander. LEA’s operation from Frobisher however only lasted for some months, as in July 1959 the contract was taken over by Wheeler Airlines, also using Otters. CF-LEA returned to its base at Gander where for the rest of the year it was used for general charter work and then in the early part of 1960 on the winter mail contract. Its next assignment was to Greenland, where EPA had secured a contract to operate internal air services on behalf of the Greenland government. As Marsh Jones explains in his book: “Our most interesting operation involved the requirement for two Otters and one Canso to carry out internal flying operations in southwest Greenland. The three aircraft, Otter CF-LEA flown by jack Kielley, Otter CF-MEX (332) flown by Ian Massie and Canso CF-CRP flown by Ben Rivard and Paul Bjerg, together with supporting maintenance crews and spares, departed Gander 26 April 1960 with refuelling stops at Goose, Knob Lake, Fort Chimo, Frobisher, Cape Dyer and arrived Sondrestrom, Greenland the following day. All aircraft were amphibious, allowing them to operate from the runway at Sondrestrom and on water at the coastal points”. The EPA crews were accommodated in the SAS Hotel in Sondrestrom and the Greenland Trade Hotel in Godthab. The aircraft flew in Greenland that summer only and returned to Gander in October 1960. From time to time Marsh Jones returned to Greenland and he describes an interesting trip carrying Danish officials which he undertook in LEA in June 1961, on amphibious floats to Umanak and Upernavik, well up the west coast. “Upernavik is actually at 73 north latitude. It was the most northern point I had ever flown, being some 350 miles north of Sondrestrom. This coast was very rugged, with many small glaciers and coastal mountain peaks over one thousand feet. Our route took us north of Sondrestrom over Christianshaab, the huge glacier at Jacobshavn, up the east side of Disko Bay, over the Nugssuaq peninsula with our first landing at Umanak, a small island with a thousand foot mountain straight up from the sea. We tied to a moored boat in the small harbour and had a very enjoyable lunch with the local Greenland Trade Manager. We were airborne again after a short business session and on our way to Upernavik, 150 miles north”. “Our weather was absolutely perfect which allowed us to cruise at 5,000 feet, giving an excellent panoramic view of the coast ahead and the inland ice cap which rose to 10,000 feet. Our destination was in sight well over 30 miles away. I was concerned with the amount of floating ice in the various bays and inlets. However at Upernavik its sheltered harbour was free of ice and allowed us ample room. While the Danish officials carried out their business my crewman arranged for a couple of drums of aviation gas to be pumped into LEA’s tanks. We then took a short walk around the village and like all Greenland villages the houses were very clean and colourful. After a short visit my passengers were ready to return to Sondrestrom where we landed after a non-stop flight of 3 hours 25 minutes. Our routing on the return flight took us directly over Qutligssat on the north coast of Disko Island. I left Sondrestrom on 16 June 1961 with Otter LEA and in 16 hours overall and 14 hours 10 minutes flying time arrived Gander with refuelling stops at Frobisher and Goose. The last three hours were at night. However we had very good visual conditions all the way”. EPA’s contract in Greenland had resumed for summer 1961, flown by Otter CF-MEX (332) until it crashed on 29 August and was replaced by CF-HXY (67). HXY continued flying into the winter of 1961/62 until it returned to Gander and was replaced by LEA, flying on wheel skis. During the winter, only points north of Sondrestrom could be served as there were no suitable landing areas to the south. LEA remained in Greenland to operate the scheduled services for summer 1962, on amphibious floats. Up to then the services had been flown on contract to the Royal Greenland Trading Department, who administered Greenland on behalf of the Danish Government, but from 1 May 1962 newly formed Greenlandair (Grønlandsfly A/S) took over the EPA contract and for summer 1962 LEA served the communities along the West Coast from its base at Sondrestrom. For a few days a week it was based at Egedesminde for flights to the communities in Disko Bay. LEA remained on in Greenland after the summer and was again put on wheel skis for operation over the winter of 1962/63. In February ’63 Otter HXY came back to Sondrestom and LEA went on maintenance to Gander. It then returned to Sondrestrom and LEA and HXY operated together in Greenland for a few weeks until LEA returned to Gander. That was to be its final trip to Greenland. LEA was re-registered to Eastern Provincial Airways (1963) Ltd., the new carrier that was formed when EPA merged with Maritime Central Airways in 1963. It flew charters for Eastern Provincial from the Gander base, and was repainted into the new EPA colour scheme. LEA suffered an accident on 16 May 1963 when it struck a soft spot in the gravel runway while taking off from St.Anthony, Newfoundland and nosed over. There were no injuries to passengers or crew but the Otter was out of commission for a time while it was repaired. The Otter had been on its amphibious floats at the time and the nose wheels sank into the soft surface. Temporary repairs were carried out and the Otter then ferried to Gander for final repairs, after which it returned to service. CF-LEA continued in service with EPA until 1970 when EPA’s bush operation and aircraft were sold to Labrador Airways Ltd. LEA was at Dorval Airport, Montréal in February 1971, being made ready for service by Labrador Airways and repainted into their colours. LEA was one of five Otters taken over by Labrador Airways whose use of the Otter was on scheduled services out of Goose Bay to the coastal communities of Labrador. LEA met with an accident at Hopedale, Labrador on 19 July 1976 on one of these services. After take-off from a runway, the pilot of the Otter, which was on amphibious floats, did not retract the wheels, causing the Otter to nose over on landing in the water at Hopedale, coming to rest with the left wing in the water. The aircraft then capsized and sank. The pilot had neglected to perform a post take-off check after departure and a pre-landing gear check before landing on the water at Hopedale. That accident ended LEA’s career with Labrador Airways. It was repaired and sold to Cargair Ltée., based at Lac Kaiagamac, St.Michel-des-Saints, Québec in spring 1978 and painted in full Cargair blue and white scheme, it flew for the company for summer 1978. On 17 May 1979 at Matagami Airport, Québec the Otter drifted off the runway during take-off in strong, gusty, cross wind conditions. The pilot attempted to continue rather than abort and the left wheel-ski collapsed on striking a gravel hummock beside the runway. 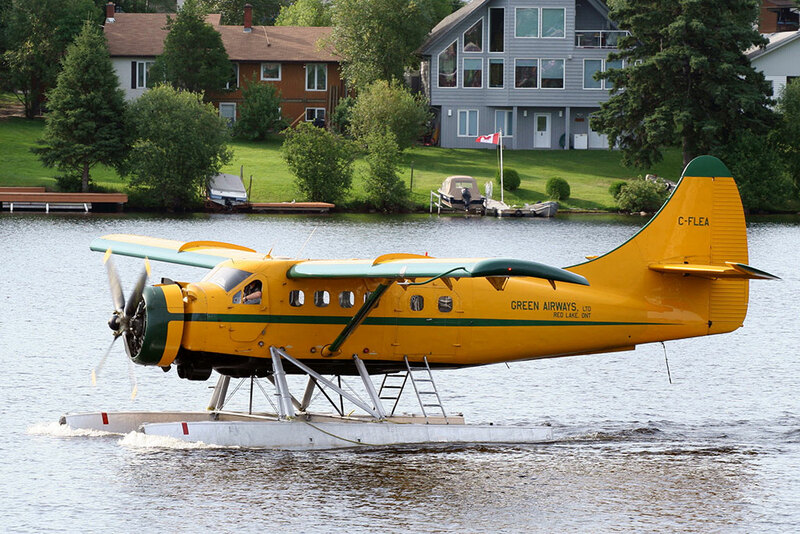 After repair, the Otter was sold to Green Airways Ltd., of Red Lake, Ontario to whom it was registered in July 1980. It was painted in the company colours of yellow overall with a green cheatline. 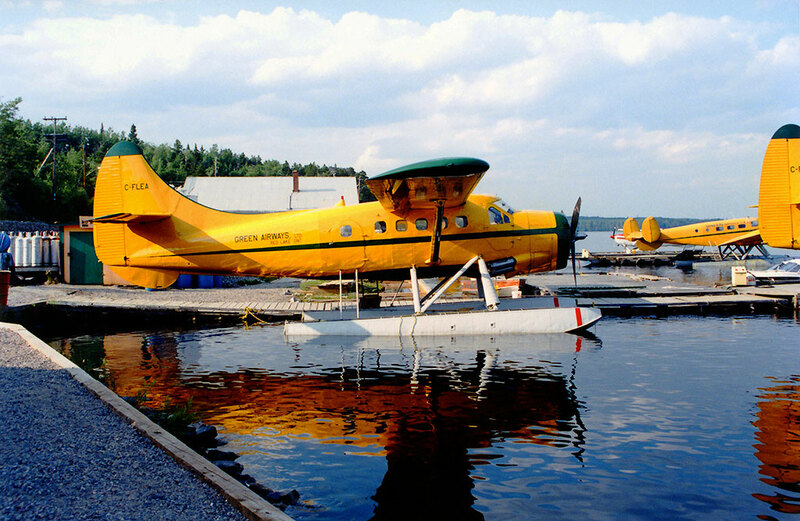 Green Airways provided the usual range of bush services into the Ontario wilderness for fishermen, hunters, tourists and exploration companies and LEA joined the company’s existing Otter C-FDAK (157). The fleet also included Cessna 180s, three Beavers, two Norsemen and a Beech 18. LEA suffered a mishap at Gullrock Lake, Ontario on 21 February 1984. The pilot was on the return leg of a charter from Papoanga Lake back to base at Red Lake when the Otter experienced a partial power loss. During a forced landing on an ice-covered lake, the right main gear collapsed. The power loss was due to a cylinder head failure. The gear failed when it struck a snowdrift after touchdown. It was repaired and returned to service and was joined in the Green Airways fleet by Otter C-FODJ (14) in November 1985. Otter DAK was disposed of the following year, but LEA and ODJ would fly together for Green Airways for many years. The company arranged for both of its Otters to be converted with the Polish PZL 1000hp engine. ODJ was converted first, during January/February 1995, at the Airtech facility at Peterborough, Ontario. LEA continued flying with its R-1340 engine until the end of the summer 1996 season when it went to Peterborough for the conversion. This was completed by the end of December 1996, being the 13th such conversion. It went directly to work on a winter contract in Northern Ontario on wheel-skis. For summer 1997 Green Airways had both of its PZL-powered Otters in service for its tourist and fishermen business. On 14 April 1999 LEA departed from Red Lake with the pilot and seven passengers on board, all fishermen, and landed at Peisk Lake. During the taxi to a suitable fishing area, one ski and gear leg broke through the ice. Minor damage to the gear and wing tip was reported, which was repaired. Operations continued during the following years. LEA was at Selkirk, Manitoba during April/May 2004 for repairs to damage sustained to the rear fuselage during operation off rough ice, before returning to Red Lake for another busy summer’s flying. An incident is reported on CADORS for 12 July 2006. LEA was preparing to depart on a VFR flight from Howey Bay, the Red Lake water aerodrome. The pilot called NAV Canada staff and was asked to stand by. Three minutes later LEA reported airborne with no prior broadcast of its intentions on the Red Lake mandatory frequency. At the time there were six other aircraft active in the zone. In May 2011 Green Airways Ltd., was put up for sale by its owners, including the associated Green’s Fly-In Camps. Bob and Jack Green, the owners of these companies, had been providing continued charter operations into the Ontario bush country for 55 years, and health and age considerations dictated a sale. Included in the sale was the seaplane base at Red Lake, Otters LEA and ODJ, both with the PZL-1000 engines and on 7850 floats, two Beavers and various single Cessnas. There were five cabins at Birch Lake, five cabins at the Berens River Camp, also cabins at Nungeser Lake, Haggart Lake, Shabu Lake and Pedlar Lake. The sale was of the entire business and assets, but if it was not sold in one lot, offers would be accepted for individual aircraft and camps. In the event no sale materialised and Green Airways continued as before. Sadly, Bob Green passed away, but the company was continued by Jack Green. 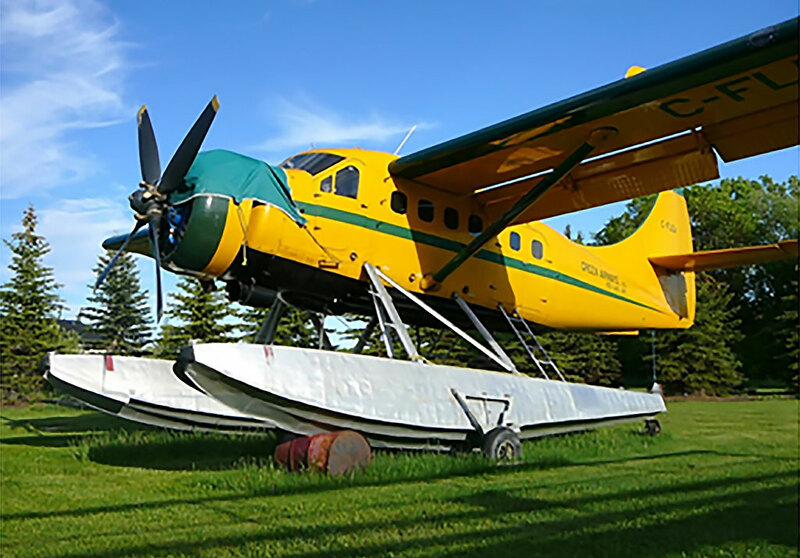 By June 2013 however both Otters were withdrawn from use in open storage at Selkirk, Manitoba with Riverside Aircraft Maintenance, their long years of service with Green Airways at an end. The company continued operations for a time with its Cessnas and Beavers. In August 2013 LEA was advertised for sale, on EDO 7850 floats and with a total airframe time of 24,716 hours. The PZL engine had nine hours on it since a major overhaul. Asking price was $665,000, same as ODJ which was also for sale. Although LEA had a newly overhauled engine, and was five years younger, it had that total time of 24,716 as against a total time of 17,177 hours for ODJ. A sale did not materialise at that time and the Otters remained in store at Selkirk. However, LEA was eventually sold and on 16 May 2016 it was registered to its new owners, Excellent Adventures Outposts & Air Service Ltd of Ear Falls, Ontario, joining their existing Otter C-FBEO (373).